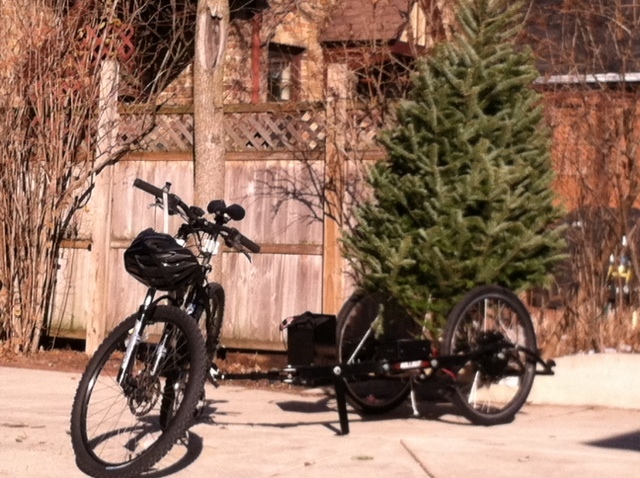 Today I used one of our bike trailer prototypes to buy a Christmas tree. Then it hit me. Why not mount it vertically and pull it around throughout December?! This rig gets lots of looks (face it, that’s the whole idea..), and as I ride down the road at 15 mph I can hear the pleasant whooshing sound of the wind through the tree. Decorations to follow. Obviously they’ll need to be connected firmly to the tree.